Harrison Ford has officially joined the cast of Anchorman 2. He will play an old esteemed news Anchor. I am excited about the return of Anchorman, but my expectations are low - as they usually are with sequels. I am just not sure if you could beat the first one. The best part of the first one was when Jack Black kicked Baxter off of the bridge...how does one recreate magic like that? 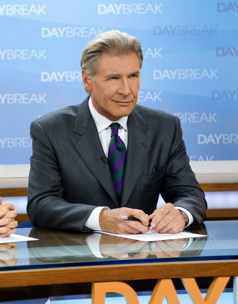 Harrison Ford played an old news anchor in the 2010 Rachel McAdams flick Morning Glory. Didn't see it, but at least he has experience behind the desk. Also joining the original cast is Kristen Wiig, James Marsden (HAWT), Dylan Bakker and Meagan Goode.